Cream scones are my new go-to. I’m over cutting butter into flour (at least for now). 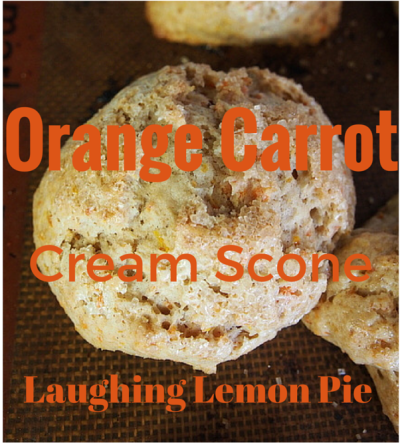 Doubly orange Orange Carrot Cream Scones (dream scones?) are one more excellent way to get more vegetables onto your breakfast table. Cream scones are so simple and delightful. The only forethought they require is having cream on hand. 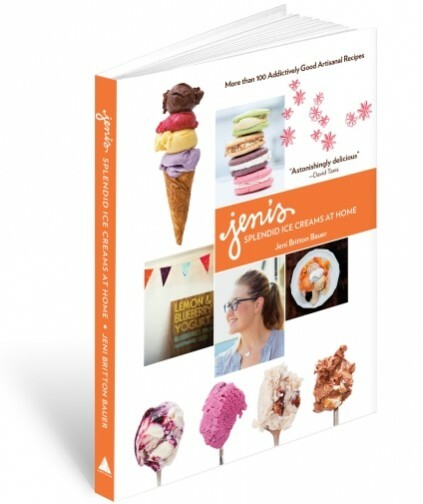 But, here’s a tip – did you know cream can be frozen? Yep, totally. Next time cream is on sale or manager’s special, or if you have a half used carton – freeze it. It doesn’t thaw in a way that you’d want to use it in a drink or a complex sauce, but it’s still perfectly good for baking. 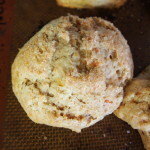 The germ of this recipe came from surprising place: Green Onion Biscuits. Yep. 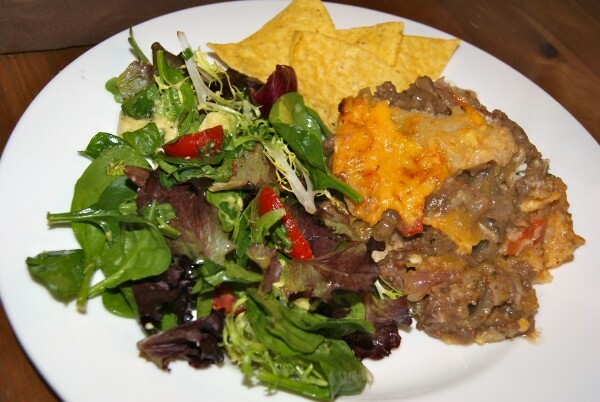 At it’s heart this recipe is just 4 ingredients. And it works just fine if you remove the savory elements – you can follow the Green Onion Biscuit recipe using just the flour, baking powder, salt, and cream and make yourself a very nice standard cream scone. It won’t be sweet on its own, but just fine for adding chocolate chips, or a sweet icing – those things balance out the lack of sugar in the recipe. It’s a wonderful basic recipe for spring-boarding your own ideas for add-ins. My riff on this cream scone recipe came out light, fluffy, and delicate with great flavor – much more orange in flavor than carrot. 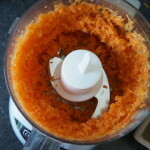 Mincing the carrots in a food processor keeps them from getting too wet, and keeps their size just right. 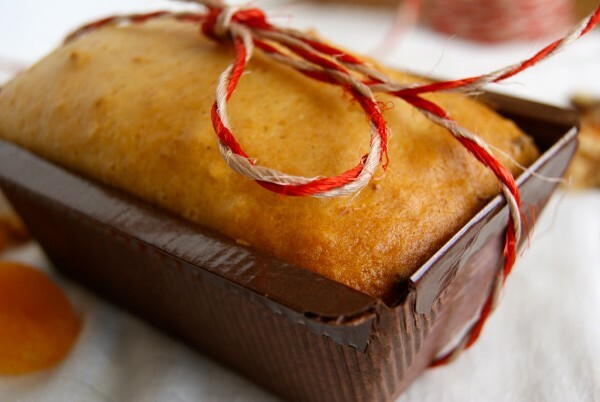 The amount of sugar you add is up to you – I put 2-4T as a guideline in the recipe. 4T (1/4 cup) makes them decidedly sweet. 2T of added sugar would be enough if you were planning to add an icing, or if your taste buds enjoy the not-so-sweet side of life. I love the flavor of brown sugar, adding it to the cream helps it get evenly distributed throughout the dough. Whisk flour, baking powder, salt and cinnamon in a medium bowl. Mix cream and brown sugar together. Zest orange into the cream/sugar, and squeeze the orange's juice in as well (probably about 2T). 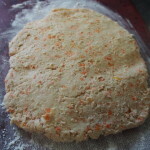 Add the minced carrot to the liquid ingredients. Toss a bit of flour on your work surface, and flop out your dough. Pat it into a disc to cut out scones, or roll them by hand into 9-10 nice little balls. Alternately you could score the disc into triangles (add about 5 minutes to the baking time if doing so). 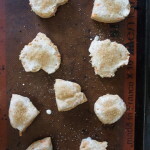 Brush the scones with cream or milk, and sprinkle with turbinado or sanding sugar. Like all scones, these are best eaten the day they’re made. This recipe is nice since it makes just about 9 scones, not too many. To store for next day I’d recommend putting them on a plate covered with a large bowl, inside a cake dome, or in a covered 9×13 type baking pan. Storing in plastic tupperware is fine, it just makes them super duper soft the next day – treading a bit too close to cookie-like for my taste.